CHICAGO, IL (Oct. 20, 2009) – Electronic Arts Inc., (NASDAQ: ERTS) today announced the launch of the EA SPORTS FIFA Soccer 10 Tour, a nationwide, 15 city, five-week long program that showcases EA’s acclaimed FIFA Soccer 10 videogame and the new slimmer and lighter 120GB Playstation®3 (PS3™) computer entertainment system. Throughout the five weeks, two vehicles outfitted with 13 TVs along with PS3™systems, plus a full-time crew, will travel the East Coast while another team will visit West Coast cities. At each Tour stop, fans will have the opportunity to play FIFA Soccer 10, as well as receive free prizes courtesy of EA SPORTS and PlayStation®, including the chance to win a PSP® (PlayStation®Portable)go system. 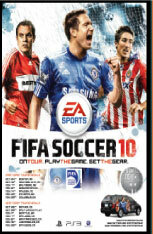 FIFA Soccer 10 will be available in retail stores throughout the United States beginning Tuesday, Oct. 20. FIFA Soccer 10 features the first-ever true 360° dribbling system that gives players finer control of the ball and the all-new Virtual Pro that enables you to live out the fantasy of playing as a professional player by putting yourself in-game using Photo Game Face. Earlier this month FIFA Soccer 10 launched in Europe selling 1.7 million copies during the first seven days, becoming the largest sports videogame launch in history. The EA SPORTS FIFA Soccer 10 Tour will be supported by an integrated marketing campaign, including live Twitter feeds, Facebook fan page updates, PlayStation.com and more, that will drive game and tour awareness, in addition to driving attendance at Tour stops. For more information about the EA SPORTS FIFA Soccer 10 Tour, including specific Tour stop details, visit the Tour’s Facebook Fan Page at http://www.facebook.com/EAFIFA10Tour or via the Tour’s Twitter Feed at http://twitter.com/EAFIFA10Tour. Visit the official EA Sports FIFA Soccer 10 game page at http://www.FIFA.EASports.com. Electronic Arts Inc. (EA), headquartered in Redwood City, California, is a leading global interactive entertainment software company. Founded in 1982, the Company develops, publishes, and distributes interactive software worldwide for video game systems, personal computers, wireless devices and the Internet. Electronic Arts markets its products under four brand names: EA™, EA SPORTS™, EA SPORTS Freestyle™ EA Mobile™ and POGO™. In fiscal 2009, EA posted GAAP net revenue of $4.2 billion and had 31 titles that sold more than one million copies. EA’s homepage and online game site is http://www.ea.com. More information about EA’s products and full text of press releases can be found on the Internet at http://info.ea.com. EA, EA SPORTS, EA SPORTS Freestyle, EA Mobile and POGO are trademarks or registered trademarks of Electronic Arts Inc. in the U.S. and/or other countries. Official FIFA licensed product ‘ © The FIFA brand OLP logo is a copyright and trademark of FIFA. All rights reserved.’ Manufactured under license by Electronic Arts Inc. Player names and likenesses used under license from FIFA, International Federation of Professional Footballers “(FIFPro)” and national teams. John Madden, NFL, NHL, NBA, NCAA, Tiger Woods and PGA Tour are trademarks of their respective owners and used with permission. Microsoft, Xbox, and Xbox 360 are registered trademarks of the Microsoft group of companies. “PlayStation”, “PLAYSTATION” and PSP are registered trademarks of Sony Computer Entertainment Inc. Memory Stick Duo™ may be required (sold separately). Nintendo DS, and Wii are trademarks of Nintendo. All other trademarks are the property of their respective owners.